I’ve been doing a little more research, finding a lot of random material, but material that I would like to include somewhere in the documentary. The following is a collection of various articles, information and data that might be useful throughout my project. Don’t know how they’ll fit in within the interviews etc. but it might be useful information to scatter about the project when I go into production. I’m really keen on including a lot of interactivity into this project and so one idea I had was to ask the viewer several questions. The answers of the questions could then be collected and used throughout the project. For yes/no questions, each answer could lead to a different area of the site. Not sure how this will fit in with my interviews etc. but just an idea. Some potential questions are listed below. – Why are you afraid? – Were you always afraid? – What do you do when you feel fear? – Are you a fighter or flighter? – Do you have a phobia? – Would you like to face your fear? One idea for the soundtrack to a certain section of the documentary was to create an aural collage of famous quotes about fear made by politicians, scholars and celebrities. The only soundbite I definitely know is available at this stage is President Roosevelt’s famous speech in the great depression, but I’m sure with further research and searching in various achieves I’ll be able to find more. 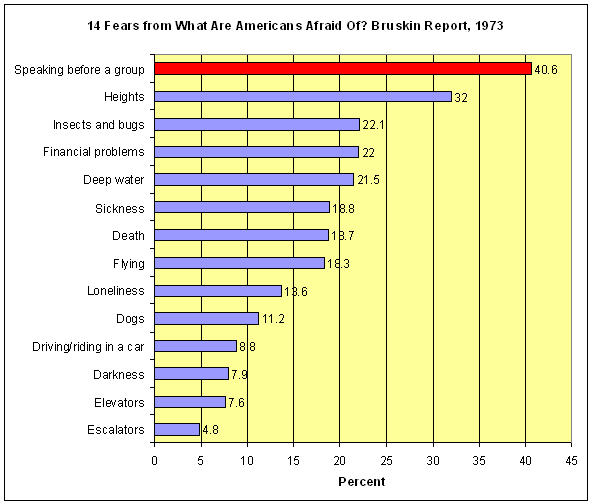 There have been a number of experiments that have explored whether fear is learnt of inbred. Some are contentious in their questionable treatment of the experiment’s subjects, but they all have interesting results. Most interesting however is this constant desire to discover how fear is created. What is the intention behind these scientists? Did they believe understanding fear would help them control it and thus control a population? WATSON: Little Albert & rat experiment: Could someone learn to be afraid of something? Watsons wanted to show that people could be conditioned to have certain emotional reactions (i.e. fear). ERIC ERICSON: Lifelong development fear theory. Trust vs. mistrust, If you don’t gain the sense of trust in your world, then you’ll resolve that on the continuum of mistrust. Looked for genetic patterns in fear. Phobialist.com provides a comprehensive list of almost all phobias that have been documented in reference books. Some are absurd and most are arcane, but perhaps these definitions could be utilized in some way throughout the project? Might be interesting to explore how fear is pacified/exacerbated by the media. Below is a compilation of some interesting fear mongering headlines from tabloid newspapers.